Thunder Lotus Games, the makers of the highly acclaimed viking adventure game Jotun, are back with their latest title which explores a quite different game genre this time. 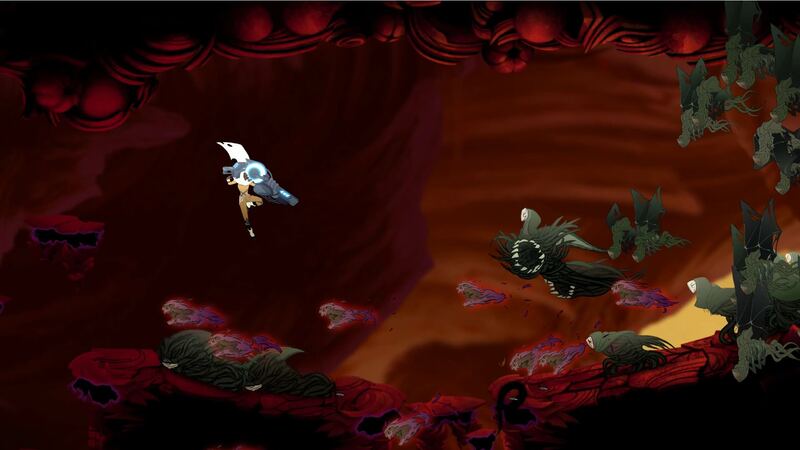 Titled Sundered, the game is a horrifying metroidvania platforming action (so many characterizations) experience only suited for the bravest of souls. One of the main premises of the game though is to give you a hard time and make you work to get to the very end of it. 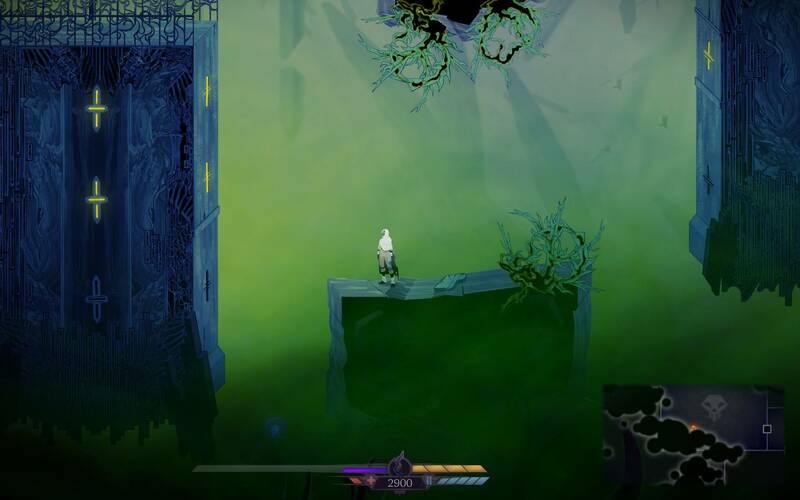 We will talk more about this though through the coming paragraphs and explore why the world of Sundered is one you should be exploring (or not, depends). We start off by seeing a girl fighting off a sandstorm in the middle of a desert, when she suddenly falls underground into what later turns out to be a complex series of caverns, all connected to one central point, the Sanctuary. We play as Eshe, that roaming girl we saw at the start, and through our playthrough, we try to find out what is going on around us by exploring the caverns and going through the endless hordes of monsters that attack us. 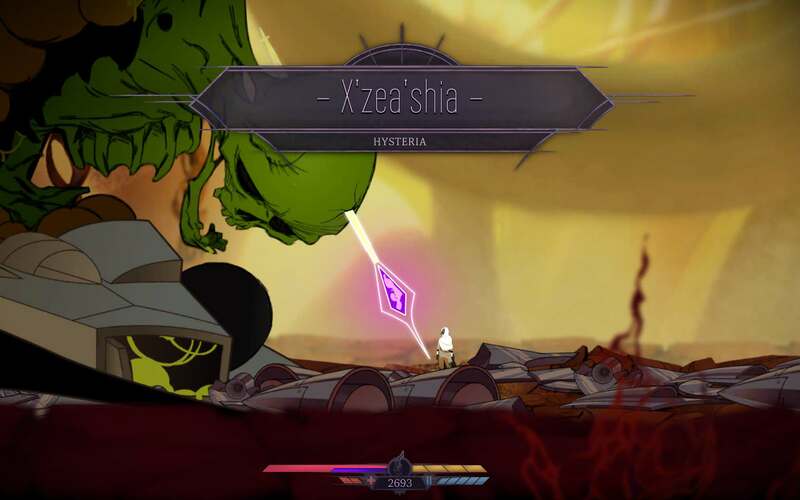 Through our journey, just like any other good Metroidvania game, we get to unlock more abilities that help us traverse the scary deeps of Sundered. Killing enemies also gives us shards which are basically the main currency of the game and are spent to unlock more skill-points on our huge skill tree that slowly opens up as we unlock more and more abilities through our playthrough. Very much like the recent action RPG games, the game allows us to go through each area in whatever order we like. I will tell you now though, that doing so might not be extremely smart, since some areas seem to be way harder than others. Either way, the freedom the game gives us makes us feel lost from the very first moment we step into the game. This feeling is quite crucial if you want to have a good Metroidvania experience, since having a lot of paths and choices to make is always exhilarating and makes you want to explore even more. We basically know nothing of the game’s lore until we start going through certain areas where a voice starts telling us things. Even then, we only know splinters of the game’s history and only after connecting a lot of dots together will we be able to understand the meaning behind all the things we see. I do not wish to give spoilers when writing reviews so I will only tell you some basic things that are basically part of the very first few places you will go through. The game is set in the city of some ancient civilization that praised some weird gods and at some point, for some reason, the Valkyries came (which were apparently humans from what I could gather) and started razing everything to the ground. The gods mock the Valkyries’ creations and through our playthrough we find certain “Elder Shards” that glow purple (signifying their intense corruption) and allow us to corrupt the abilities that we have unlocked, giving them further potential and power. The game is quite interesting when it comes to making permanent choices, because using those Elder Shards is something we cannot take it back and we are at the same time, given the choice to destroy the Elder Shards instead of using them. “Resist or Embrace” was the main motto behind the company’s marketing campaign and soon enough while playing the game, we realize that we have the choice to either embrace the corruption or resist it. Based on how we have gone through the game, we also get a different ending boss, making it all the more interesting for potential future playthrough. What would you do? Embrace or Resist? Well I embraced and I can tell you… it felt pretty darn good. Sundered looked beautiful on its launch trailer and it actually ended up living up to its hype visually. The sketches of both background and living things inside of it were just stunning and very well animated. Every move I made felt fluid and as part of every combo I ended up creating through my various abilities. That also plays well into the ease of the controls and how the gameplay feels in flow at all times, allowing us to dodge incoming abilities even while we’re in the middle of a melee combo. Hit, dash, hit, hook, roll, hit. Things like that were the bread and butter in every fight I had. The game however disappointed me on many of its parts. Before going on to explain how inexplicably difficult for the wrong reasons the game was, I have to say that I did indeed play it on hard mode instead of normal mode and thus have a different experience. I did end up playing the game for about an hour on normal mode just to see how it feels on a lower difficulty, but I can tell you that the idea stays pretty much the same. I do not want to sound cocky, but I do have a fair bit of experience on action platform games and therefore adapted to the controls and all the hazards around me pretty fast. I say that, because I cannot imagine how much more difficult it will be for the average player to adapt to things like the ones Sundered throws in our face. The game was hard in a bad way. The enemies clamped up in weird ways, the AI acted weird on various occasions and it just felt unfair from the very first few moments. If it was just unfair, that would be fine, but instead, it was also tiring. I managed to farm just a few shards before I died every time, allowing me to upgrade just one or two points on an ability (like health, shield or damage values) before jumping back into the fray and by “jumping,” I mean walking. Walking for about 10 minutes before I manage to reach the point where I was, before I die again. And again. And again. And again. I believe you get my point by now. The game felt like a grind fest. I had to spend about 3 to 4 hours grinding enemies, dying over and over again, before I felt able to even take on some areas and even a mini-boss. No, not one of the big bosses, but an actual mini-boss, which is supposed to be a bit easier than a big boss. As soon as I grinded a bit, I felt I was ready to go and despite some deaths here and there, I felt it was easier to kill enemies here and there. As soon as I changed area though, the same kind of unfairness hit me in the face again and the grinding commenced yet again. I thought the same would happen in the final area too, but I had grinded so much that I pretty much just bypassed everything and did all the objectives in no time. It kinda helped that the area was more open too and I had all these movement abilities that allowed me to delve in it with much more ease. But what about the bosses? Well, I can tell you about that too, but it is not a happy story.